Experts Review Available Data on Commonly Used Complementary and Alternative Medicine Treatments for Mood Disorders. It was a rainy and gray weekend of the 13th and 14th February but my spirits were lifted and energised with a wonderful and peaceful weekend at Leura, up in the Blue Mountains west of Sydney, Australia about a 75 minute drive from my home. I was at the Peacefulness in Teaching one-day retreat at the Brahma Kumaris Centre for Spiritual Learning. This was my first visit to the beautiful sanctuary which sits on 132 acres of bushland with wonderful mountain air, lovely gardens, creeks and waterfall (Where Waters Meet – an ancient Aboriginal healing place) and views to a serene valley. The weekend was also special as it was both the start of the Lunar New Year (Year of the Tiger) as well as Valentines Day and the energy of New Beginnings, Courage, Strength, Adventure and Love were definitely in the air. Piao went up a day earlier on Friday afternoon by train to start the 3 day Spiritual Awareness for Men’s Retreat and I went up with my daughter for the one day on Saturday. Piao reveals he has had a great discovery weekend. Our retreat was attended by mostly school teachers, a life coach and myself. We had time to share our experiences as teachers always in a giving mode, we discussed our emotions, triggers, past experiences, awareness, conflict resolution, talking to our body to reveal cause of upsets, Brain Gym and Living Value and other topics. In the second session after a wonderful lunch we balanced lots of dancing with some lively Latin American beats and movements with constrasting calming and relaxing meditative Yo Chi. 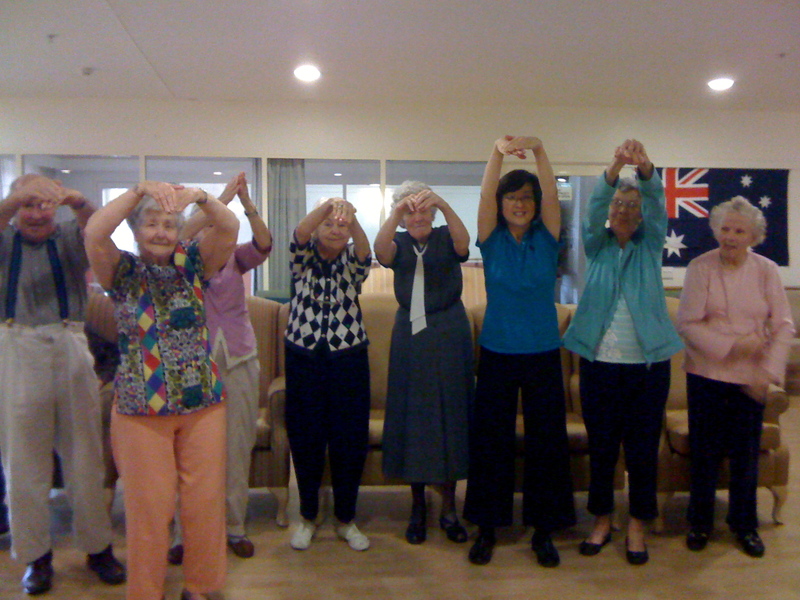 Teacher Marilyn made sure we moved our bodies to experience some liberating self-expressions. This February 2010 marked the beginning milestone for our family to learn more about our being, who we really are, why we are here, our purpose in this life and meditation practices to guide and empower us in our spiritual journey. The three children and I have also just started the Raja Yoga meditation course, once a week, with a lovely teacher Helen near where we live. This has taken about 2 years for all this to happen but I appreciate my BK friends Pam, Kamal and Acacio for their quiet, gentle nurturing ways and inspirations, with no expectations, demands or agenda. There is a saying “When the student is ready, the teacher arrives”. I stayed a night and was able to have some heartfelt conversations with several of the BK family members, especially Tony and Nancy, and all were very warm and welcoming to me. The vegetarian meals were delightful and nourishing, prepared with much Love and Care. Enjoyed the Silence at dinner with cosy candles in the dining room. Sister Sally was very kind and trusting to invite me to come back regularly to take the retreat participants for some Qigong and Tai Chi exercises in the mornings and to enjoy this wonderful place and all it has to offer. I am humbled and honoured by her request and hope to work out some possible dates to do so in the near future. My understanding is Tai Chi and Qigong is Mind, Body Spirit in Harmony and when I practice the forms here and share with others we can be more in tune holistically and feel the phrase “Motion in Stillness, Stillness in Motion” come truly into our being. The ultimate will be when I can give up the forms and be in the ‘formless’. The Sunday was also special when I had an encounter with a stranger – a lovely lady who sitting by the roadway when I was driving out of the retreat centre on my way to visit my friend Dianne. At first I thought she was “meditating” sitting by the roadway but when I stopped to ask if she was OK she related her dilemma – she had sprained her ankle quite badly and I offered to drive her to her home nearby. At her home I made her comfortable, recalled R.I.C.E (Rest, Ice and Elevation but both of us couldn’t remember what ‘C’ stood for! ), used my trusty Bio Disc (read Water and Body Energiser page) which I carry with me all the time and made some energised water for drinking and spraying on her leg and ankle. First aid included the ice to reduce swelling and using the light with my bio disc giving scalar energy to help her sprained ankle which was starting to slightly swell. I hope this energy will help her manage the swelling somewhat till she can go to the doctors to get it all checked out. In our conversation she mentioned that she is a Shaman and I said I would love to know more about her healing energy work next time I came back to Leura. We said goodbye with a warm hug as if we had known each other for a long time and she thanked me for being an angel. Feels like I am on the right path, being there helping others when in need. 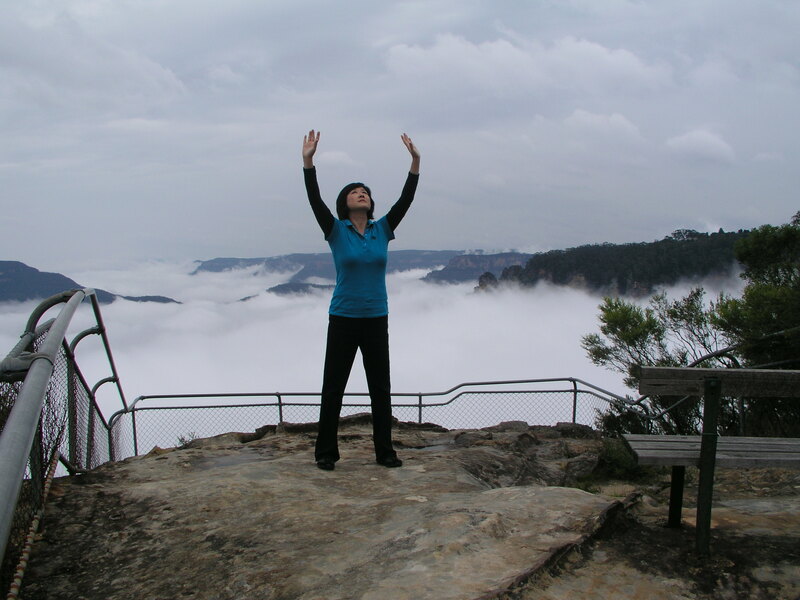 When I finally got to Dianne’s home she brought me to an off-the-tourist spot nearby in Leura that looked out to the cliffs so that we could check out places where I may be able to do more filming of Qigong and Tai Chi for our next DVD project. We were lucky the rain held and when we walked down some dirt track we came to this heavenly spot east of the famous Three Sisters cliff (Katoomba). 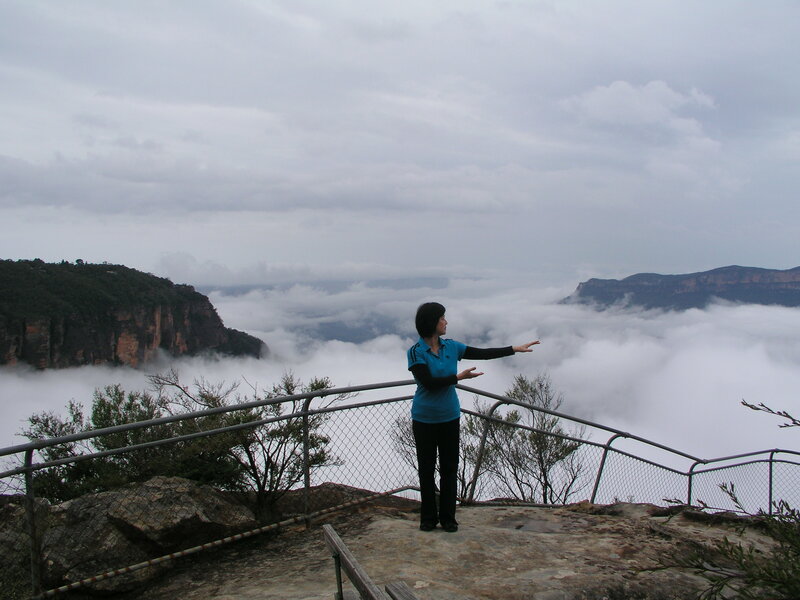 Huge thick swirls of clouds and mist enveloped the valley between the cliffs below where we looked out. 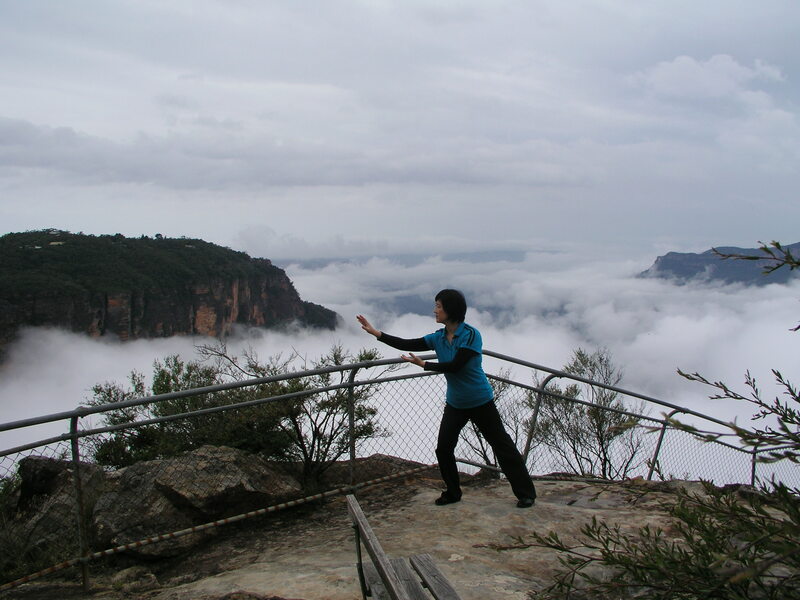 The scenery inspired me to do some Qigong and Tai Chi postures that had names like “Parting the Clouds” and “Cloud Hands”. We snapped a few quick photos but they came out rather lovely and mysterious, as if I was part of the clouds above and below. Here are some photos taken by Dianne of me on this rocky ledge lookout. Thanks Dianne for the time together connecting and also discussing many things on wellness of body, mind and spirit, including topics on ‘staying centred in your own being’, ‘throwing a rope to help’, the word Appreciate vs Grateful, ‘Independent Contractor’, Healing Codes. writing down only positive words about a person and more.